Are you thinking, "They visited Pompeii!" after reading that title? Well, you'd be so close... but no cigar. Indeed, Pompeii was buried by Mt. Vesuvius' overwhelming eruption in A.D. 79, is right outside of Naples, and is a huge tourist attraction. However, the advice of our guidebook and friends who live around Naples was: "Skip Pompeii--it's boring, huge, hot, and there isn't much to see--and go to Herculaneum instead." Our guidebook said Herculaneum was a smaller town near Pompeii that was also buried by the same eruption of Vesvius, but it was discovered later and better excavated, thus meaning there is much more to see. 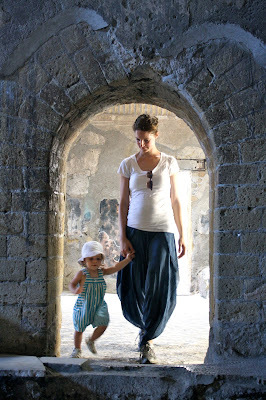 As "visit Pompeii" was never on our bucket list of life, we swapped one out for the other. 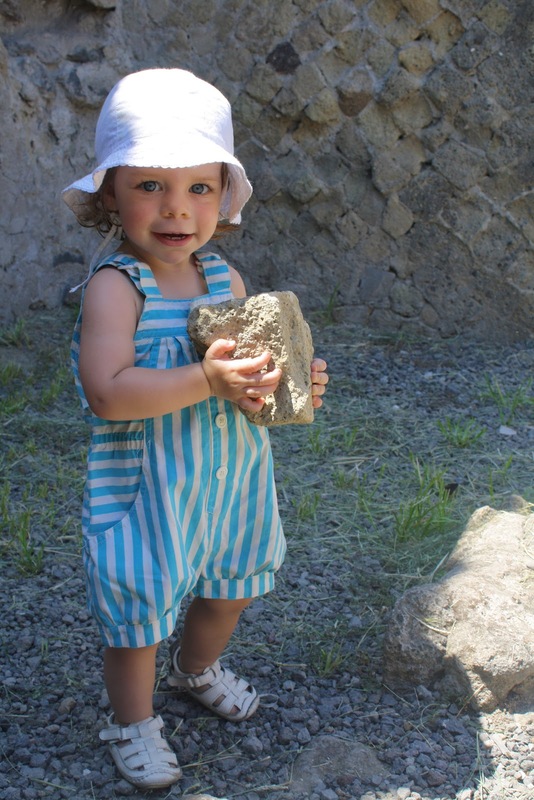 About to descend into the ancient buried city of Herculaneum (and all Lena cares about is her pine cone). Beautifully preserved in volcanic mud for 2,000 years. Peering under the glass at more preserved frescoes. "Umm, guys... I climbed into the pool but where's the water?" Lena climbed all the stairs (approximately 100) leading out of Herculaneum and up to regular ground, grunting with effort after each one. So cute. We left the ruins and the shadow of Mt Vesuvius and drove a couple of hours south to the Amalfi Coast. Famed for its winding highway over the water that links beautiful beach towns together, this is one of the top tourist destinations in Italy. We took a break from our drive on one of the beaches and Elliott and Lena collected sea glass. That first picture - Those BLUE EYES!! Wow! Living in Sicily must be so beautiful. And the weather...sigh! I love when people in the know tell me the better local options. The pictures look amazing, and now I know to skip Pompei. :) Great pants, by the way. My dad bought my Mom a beautiful wedding ring set in Naples in 1960 when we were stationed at Sigonella. I wear that set today. Both my girls want it. So now what do I do? !